<< Starfinder Society Roleplaying Guild Scenario #1-14: Star Sugar Heartlove!!! This Quest works great as an introductory adventure for new players and GMs. It has lots of helpful hints throughout it, some fun player handouts, and is a real tour de force of the different kinds of scenarios you might play in the Starfinder Society. The first three quests can be completed in any order, although the fourth quest is the culmination of the previous three and should be done last. The first Quest is entitled ‘Megaplex’ and is set in the Towershadow region of the Megaplex settlement of ‘Striving’ on Aballon. This is a pretty straightforward Quest which involves a battle in and around cramped spaces, and some negotiation. It’s quite brief in feel, and was probably the Quest I enjoyed least. That being said, it’s also the easiest of the Quests to run and play through, so if you’re a new GM or player I highly recommend starting with this one! The second Quest is entitled ‘River Rat’ and is set in the asteroid belt known as the Diaspora. It features a very strategic, unique starship combat which I rather enjoyed. There’s some great opening social interactions you can engage in with your opponents before the battle. It was lovely to see! The third Quest is entitled ‘Bad Chameleon’ and takes place in the sector of Verces’ Ring of Nations known as Vanos. This area is known for it’s high-end nightlife. In this scenario you’ll need to blend in among the wealthy clientele of this neighbourhood, and perform a heist. It’s very free-form, and really allows players to be creative. It has some fun social encounters and a delightfully foul enemy, with some creepy artwork which really made it memorable. I really enjoyed this quest. The final Quest is entitled ‘Nightmare,’ and is a lovely little delve into a ruin where you can utilize your tablet pieces and achieve your goals. If you can get past the obstacles contained within! Nightmare takes place on Praehan, one of the moons of Liavara. In addition to being a ‘dungeon delve’ style of adventure, it also features a bunch of awesome environmental hazards. You’ll have to deal with weather, atmosphere, gravity, and attempt to swim through liquid methane (which is much harder than it sounds). It has an exciting enemy with a great premise, stats, and art which serves as a wonderful climax to this adventure. Plenty of the story regarding this encounter isn't explained or revealed to PCs, though, which is really unfortunate. A good GM can tidy that up without too much trouble. My major issue with this scenario is that, as with many quests, it feels disjointed. Dreaming of the Future is a tidy collection of four quests that work excellently as a full 4-part scenario. The set up is fairly mundane: go find three MacGuffins that'll take you to the final MacGuffin, but the individual quests are interesting and engaging (Particularly 'Bad Chameleon' and 'Nightmare'), and you forget about the mundane structure soon enough. The writing talent behind these quests is really strong, and they manage to get a lot of engaging content squeezed into very few pages! Of course, that doesn't mean that they're flawless. I have some issues with the first quest ('Megaplex') and there's a disappointing number of errors or flaws that could have been caught in editing throughout. Furthermore, the final conclusion is very weak (almost missing entirely), and desperately needs a GM to flesh it out into something more satisfying. Overall though, some really awesome elements in here, and I'd definitely recommend this set of quests to any group, new or experienced with Starfinder. The Megaplex quest suffers from being nonsensical in setup: 'All we know is there's an android in legal trouble somewhere in this general region of this planet, go find them'. Players were confused and taken out of the story. Megaplex also lacks basic detail required to explain why the events are occurring: What do the PCs learn that reveals Lerecti's location to them? Why do they find them at a convenience store? What other options do they have for getting the tablet? Etc etc. Megaplex's organization leaves the GM bouncing around the section to try to figure out character motivations. Megaplex's setup and story suggest that multiple approaches might be reasonable, but the adventure forces a non-intuitive series of events, where skill checks have little to no visible effect for the PCs. River Rat's rules for keeping Mr Smiles talking are unclear, as are the rules for identifying the turrets. In Nightmare, the first battery of skill checks to cover the external hike are almost impossible to fail. Additionally, it was difficult to explain why being good at balancing was helping the whole team avoid being blown away in the icestorm. In Nightmare, nothing pressing seems to stop the PCs from taking 8 hours to recover from any fatigue, nor does the sickened condition from the missile trap seem to have any effect. This makes all the skill checks at least somewhat meaningless. In Nightmare, the time to enter and leave the moon is undefined by the scenario. My PCs really wanted to know these things because they were concerned about the limited environmental seal uptime on their armor! More generally, the combats, barring the last one, were far too easy. These are 1/day encounters where parties have full resources and could stand to be more challenging. The River Rat encounter, particularly if the turrets are dealt with, is very easy, but rather time consuming. Little tension or engagement. The use of 'key tablets' as a MacGuffin was rather uninspired, considering the theming of the overall mission. Additionally, the final reward of vaguely defined 'dreaming tools' was a real loss of potential lore and engagement! The ending in general is extremely abrupt and unsatisfying. The River Rat's turret mechanics and terrain-filled arena both made sense for the scenario and added an extra dimension to the combat! I was very impressed that a simple, introductory starship combat was given cool gimmicks this way. Unfortunately, as mentioned above, the combat was a bit too easy despite these bits. Everything in Bad Chameleon was awesome. From the descriptions of the streets of Vanos, to the freeform structure of investigating the club, to the various options for influencing the final encounter with Bogdin. Androids in my group loved the chance to free some fellow androids! And some very simple things (like the two bartender androids being named after the club rather than anything else) really made the setting hit home. There's a lot of juicy detail in very few pages! (Though the fight vs. Bogdin and his bouncers could stand to be harder, considering how many advantages the PCs can accrue). While I wasn't sold on the mechanics behind traversing the moon, Preahan, my players liked the atmosphere and presentation. The whole Nightmare Dragon concept was unexpected and well received by my group. The dragonblood-theme character was psyched to get some use out of their theme feature. The fight with Kanavu's shade is suitably epic for a low level encounter and a cool way to cap things off. WTH happened in that night club?! Played this as a final unscheduled slot of a convention last weekend; Low tier, 6 players. As an experienced Pathfinder player not too kind on sci-fi, after a year keeping distance from Starfinder, I decided to give SFS a go. As quests go, these were straightforward: Go there, do some investigation, do a combat and get out out, which works fine. Some portions of the setting were lost on me, but the quests were interesting, an as a whole are a pretty good showcase of what SFS has to offer: some space combat, some fighting, some infiltrating, and an iconic final boss, which is always nice. Highlight of the session was the third quest, which started with our Operative going on a solo mission, while the soldier was providing a distraction, and the rest of us were just hanging around. Street a bit, or operative said "alright close your eyes and proceed towards the exit". Things had already been escalating because of role-playing, but that turned everything into mayhem. 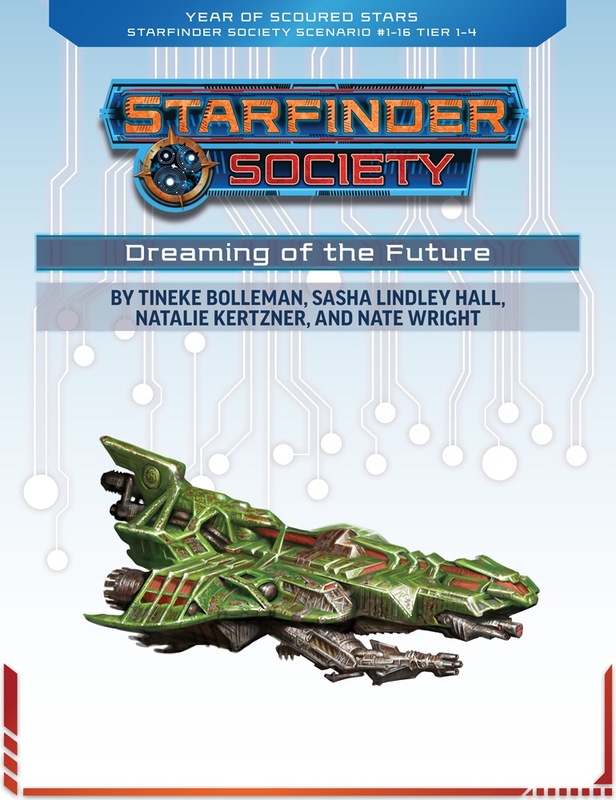 Dreaming of the Future is a linked series of four Quests and is one of the few Starfinder Society scenarios with the Repeatable tag. I ran it at low tier for a mixture of three experienced players and two players new to the game. Although I think it was great to see some long-time members of the Paizo community get a chance to write for the company, unfortunately I wasn’t very impressed with the results. Although there are some exceptions, for the most part the Quests are underwritten and lack the flavour and encounter creativity that I was hoping to see. It’s okay, and because it runs short, it could be a good way to introduce new players to the game if they’ll need extra time to figure out basic rules. But otherwise, I’d give this a pass or do one of the better introductory scenarios like The Commencement. The backstory behind Dreaming of the Future is that the Starfinder Society has long relied upon mystical means of research to help develop their goals and mission planning. One of these mystical means is a Liavaran Dreamer, a sort of off-shoot of the Barathu of Bretheda (floating sentient telepathic jellyfish-like creatures). The Dreamer, “Whisperer of Solar Winds”, often has visions that it relates through cryptic tales. If the tales are interpreted properly, they often lead to important discoveries. In this series of Quests, the PCs are sent by Venture-Captain Arvin (whose personality still hasn’t been developed yet) to recover three stone tablets on three different worlds that, once combined, form a map leading to an ancient mausoleum of a former Dreamer; and inside that mausoleum, relics can be taken which will augment the abilities of the current Dreamer. I never thought about while prepping or running the session, but I’ve just realized the SFS is going to engage in what is (despite its description) some tomb-robbing! One of the criticisms I’ve had of other Starfinder Society scenarios is too much “telling, not showing.” The concept of the Liavaran Dreamers is a really interesting and evocative one; wouldn’t it be cool for the PCs to actually meet one? And get a chance to interpret its visions themselves, perhaps with the aid of some skill checks if they get stuck? Similarly, jumping to the very end, the relics the PCs are sent to retrieve have nothing particularly interesting or exciting attached to them—they’re just “strangely shaped bottles and cryptic devices.” The PCs can’t find anything else out about them, why they’ll help the Dreamer, etc. In other words, they’re a MacGuffin purely for the sake of a MacGuffin, and RPG storytelling has evolved past that. Anyway, on to the Quests. Quest # 1, “Megaplex” has the PCs going to the Towershadow Megaplex on Aballon (the planet of constructs called anacites). The PCs are told that the Dreamer’s first vision requires them to find “some form of artificial or partially artificial life, likely an anacite or android, on the run from legal woes.” That’s all they have to go on—searching a city of countless thousands (or millions?) of constructs to pinpoint one “on the run from legal woes” who has the tablet? The Quest doesn’t provide any info on how this search would realistically work; it just list a few skill checks PCs can make in what essentially boils down to “ask around or Google it.” Gamers are used to the necessity of the suspension of disbelief, but this came across as just lazy writing and I was a bit embarrassed to run it as a GM. In any event (whether they succeed or fail on those skill checks! ), the PCs will find the fellow with the tablet, an android from Verces named Latrecis. Latrecis discovered his employer, a nightclub owner named Karelite Bogdin, was trafficking in illegal android smuggling. But before Latrecis could act, his boss framed him for a murder and he had to go on the run; he stole the tablet from Latrecis as a sort of insurance policy. However, like real-world insurance companies, coverage is never as much as you’d like: Bogdin has sent thugs after Latrecis, and they stole the one piece of evidence that Latrecis had to prove his innocence (this whole sequence of events is weird, but the PCs thankfully will learn little of it). So, in order to get the tablet, the PCs have to deal with the thugs that are menacing Latrecis. This requires the classic “boss and two minions” battle on a cramped flip-mat. It’s rather forgettable. The second Quest, “River Rat”, has the PCs being sent to the Diaspora (a massive asteroid belt with a variety of inhabitants). I found (running these in order) that little was done to tie the Quests together smoothly, and I had to improve some connective tissue. This Quest is all about a starship battle against a ship of ysoki pirate/salvagers that have taken over a dwarven outpost. There’s the possibility for some role-playing with the captain of the other ship before the battle, which I appreciated and tried to make the most of even though it can’t change the fact that combat is inevitable. The starship combat itself is ship vs. ship with some asteroids scattered around, with the big gimmick being that the ysokis have hidden some gun turrets on a couple of the asteroids. This could have been a cool surprise for the PCs, but it’s very easy to find and then (automatically) disable them, so they never got used in my game. Apart from that, the starship combat itself was of the type that I had hoped the devs were moving away from: a “pew-pew” slog of pea-shooters where the PCs' ship clearly outmatches the enemy ship and there’s no real threat. It’s just a matter of playing the rounds out and waiting for the rolls to confirm what everyone knows. The third Quest, “Bad Chameleon”, ended up being more fun that I thought it would be. The PCs have to infiltrate a nightclub (run by Latrecis’ employer from the first Quest) to steal a third piece of tablet from a safe. What’s supposed to happen is that the PCs get into the nightclub, chat with some bartenders and patrons, and then sneak through an alarmed door to where they can pop the safe and get the tablet. Then, on the way out, Bogdin (an augmented verthani) and his two vesk bodyguards (SFS trope!) try to stop the PCs from leaving. Hilariously though, the PCs I ran this for were uniformly terrible at Deception and Stealth and just could not make it through to the room with the safe without being repeatedly obstructed by the regular guards on duty. So after about 45 minutes (real-time), they decided to just wait until Bogdin showed up to try to trick/force him into giving them the tablet. It made for a surprising and fun conclusion. Also, I have to give props to the flip-mat used for the scenario—it fit the needs of the mission quite well. As written, my favourite of the Quests is the fourth one: “Nightmare.” It has a very evocative (and creative) setting and a suitably atmospheric tone to match. The PCs are sent to Preahan, one of the “shepherd moons” of Liavara. But Preahan is no ordinary moon: it has low gravity, an atmosphere of methane, and an inner core of liquid methane. So the PCs have some interesting and difficult skill checks to make as they descend into the core of the moon to find the mausoleum. Inside, a “nightmare dragon” pretends to be the guardian of the relics and this was a solid story choice: it fooled my PCs, and the guardian’s later sneak attack was a surprising twist. The battle was suitably difficult as well (including a PC death, something I’ve never seen during a Quest!). My only complaint about this Quest was, as I mentioned previously that the relics were so poorly described and inconsequential. When PCs do a lot of work on a fetch quest, make it cool for them when they succeed. All in all, Dreaming of the Future is a mixed bag. Hopefully, it’ll serve as good practice for the writers and developers, and we’ll see stronger storytelling next time around. About as good as quests get. So I have a friend who hates quests because they are so disconnected and disjointed from each other, and even he liked this game. Generally solid plot and good story. Some of the quests are a little cliche, and it would have been nice to see some of them fleshed out a bit more, because there are a few contrived coincidences, but what do you expect for one hour time slots per adventure? Considering the ‘one combat per day’ nature of the scenario, the fights could have been harder. And I will say that I was quite disappointed that my Dream Prophet who essentially studies/worships the Liavaran Dreamers did not get to role-play/use that aspect of their character in the scenario that touts being all about a dreamer. Final quest was a good finisher though, really unique ideas. Even better, quests involving Liavara: the Dreamer and Brethedan culture! Oh, and look Tineke and my friend Nate (aka Rosc) are credited here. Nate and Tineke, is this your first SFS credit? I also want to note that I approve of the size — 4 quests works great in a 4 hour convention slot. I hope there's a recipe for Brethedan Bubble Tea! This sounds like a really cool quest series! Aww yeah! Bingo, I have all of thise! It's super helpful for us GMs when you guys post this. It sure is! I'm super excited about seeing our hard work come to fruition. Can't wait to run it and play it! My obvious reasons to like it aside, I'm also super happy that there's more evergreen content coming out. Not only that, but it's a 1-4, so it's way more inclusive to our characters. Sorry for the previously panicked posting. You had already clarified my question on the blog's comments before I posted this. Please, please reverse the statement in this week's blog that this scenario is only Repeatable for 1st level characters! The consistency and simplicity of the Repeatable tag across all tiers for SFS is a selling point for the campaign (as compared to PFS) that should not be sacrificed! Thurston finished up development on this adventure this week and from his reactions, players are in for a treat! Besides #1-99, we have two new scenarios debuting at Origins—Starfinder Society Scenario #1-16: Dreaming of the Future is a 4-part quest pack for character levels 1-4 (replayable with 1st level characters) and Starfinder Society Scenario #1-17: Reclaiming the Time-Lost Tear, a continuation of the season metaplot involving the First Seeker [elect] Luwazi Elsebo's mission to return to the Scoured Stars. That was just Tonya mixing up the campaigns. But in the map thera are not a second marked area, Does anyone know where it is? other GMs have noted the problem as well. A couple of different approaches were offered, such as just letting the PCs who succeed on the checks pick where they want to start. Why aren't boons allowed to be slotted for this adventure? IMO that is really dumb. I finally got a really useful boon, and the next adventure I play after acquiring it won't let me slot it. Why even bother handing them out? I'm super frustrated by that. I cannot seem to find anything that marks a second area? Is this suppose to mean near where the verthani and ishketi are? Any help would be appreciated as other gms in my lodge are also confused. Check the thread in the Organized Play GM Discussion forum and you'll see a few different ways that GMs have handled this. The four player adjustment for low tier in River Rat is no balance adjustment at all. The ship only has one weapon at that tier so loosing a gunner when you have two already is irrelevant. This was my first ever SFS adventure. I enjoyed the scenario - lots of variety, with different ways to handle the quests. Starship combat was cool too. the night club scenario was very cool - with a lot of different ways to pull off the heist. I enjoyed freeing the androids too as a bonus opportunity. Our ship stayed well clear of the turrets, so we didn't get to see much of what they do. We took care of the stolen evidence quest pretty quickly with some good diplomacy/intimidate, as well as a few good rolls. I think this adventure was well written, with a lot of cool scenarios you can run. Our GM was pressed for time, so we had to rush the last encounter a bit (new players - slowly going through the adventure), but overall we had a great time. the way I wrote it the River Rat still needs a second gunner to man the turrets.